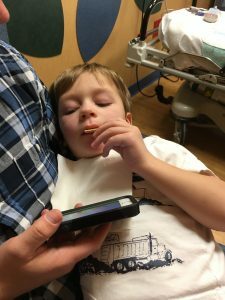 February 2017 Medical Update - Adventures with the Tuleys! It’s been a busy month, medically speaking. This is a clinic where Josiah sees a team of doctors and therapists. He saw Occupational, Physical & Speech therapists, a nutritionist, pediatrician, orthopedic surgeon, and his rehabilitation doctor. The therapies are all going well and we are going to continue with what we’ve been doing – two 45 minute OT, two 45 minute speech, and one 45 minute PT each week. The nutritionist and pediatrician visits were pretty standard. The orthopedic surgeon is just monitoring Josiah at this time and we’re holding out as long as we can before any surgeries need to happen. Right now, the concern is his right leg getting tight. As of now, Josiah still has the range of motion in his ankle, although it’s not easy for him to utilize the full range. As long as he continues to have range of motion, he’s doing well. The rehab doctor helped with Josiah’s leg brace, which he has refused to wear since he first got the brace in October. 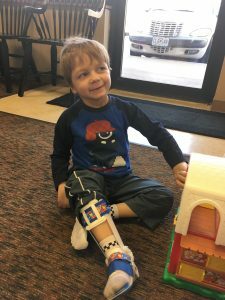 We met with an orthotist, who has taken the brace and updated it to better fit Josiah’s needs. She also added color and Paw Patrol straps to make it Josiah friendly – much better than the plain white one we were given. A lot of work had to be done to fix the brace, and a separate insert was needed for his other foot. It was pretty frustrating that the local company we worked with had not done what was best for Josiah. 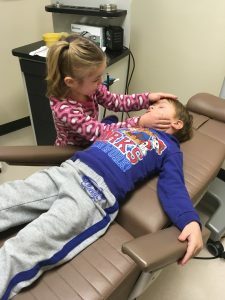 Thankfully, our insurance will be changing in May, and we can now go to this orthotic clinic in Columbia, who focuses on pediatrics and works closely with Josiah’s rehab doctor. We left our house at 6:30 to be at the hospital for botox. This appointment was very different than all the others we’d done previously. Before, all the focus was in Josiah’s elbow, wrist, thumb and fingers. His wrist and fingers have stayed fairly loose, so the only botox needed in his arm was for the elbow. Because of this, we focused on his right calf muscle, which has been tight recently. I’m not sure if it’s because he’s grown so much or if it’s because he’s not worn a leg brace since early fall. Either way, when he walked, he was not putting his heel down and walking only on the front part of his foot. The botox in the calf muscle should help relax him a little bit and help with that movement. That’s our hope and what is buying time before any surgeries need to happen! We also attempted a different type of sedative at this appointment. Because Josiah hates shots and IV’s so much, we opted for an oral sedative. The downside to oral medication is that he was not asleep during the shots, although he does not remember anything. (We were told the sedative makes it similar to being drunk.) I’m not sure which was better. We didn’t have to hold him down for a shot or needle, but did have to hold him down for five botox shots (two in the arm, three in the leg.) While he doesn’t remember the shots, it was still hard to have him awake for that time. We were able to leave the hospital sooner with the oral sedative, because he never actually went to sleep. He watched some shows for a little bit until he was ready to eat. 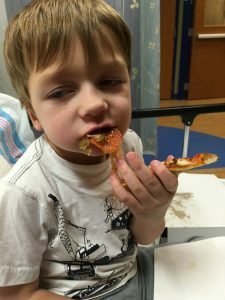 We gave him crackers and juice but he kept saying “pizza…pizza…piiiiizzzzzaaaaaa,” so we ordered him some pizza. He ate half of it and seemed good to go. Afterwards, he was still a little woozy, so we couldn’t let him walk on his own, although he thought he was perfectly capable. That was difficult. 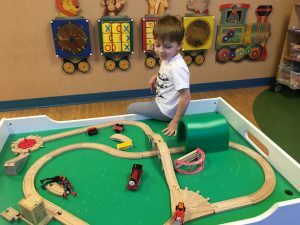 Josiah saw his endocrinologist, who monitors his growth and hormone medications. We had his labs drawn while he was out for botox, and got the results back. We are increasing his thyroid medication and will check the levels again in six weeks. Josiah continues to grow with the growth hormone and he’s continuing to do well with all his other medication. 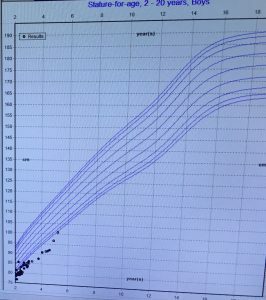 The photo shows Josiah’s growth chart. The cluster of dots on the bottom are when he was weighed and measured weekly for chemotherapy. You can see how he’s grown significantly with the growth hormone and is now on the growth chart! I had noticed a rash on Josiah’s side that morning, so I had the endocrinologist look at it before we left to go home. He thought the rash looked like chickenpox or a shingles rash, so I made an appointment with our family doctor to have that checked out while we were in town. 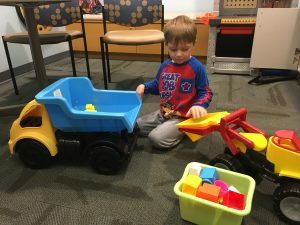 He didn’t get an actual diagnosis, but the rash looked very much like shingles (which is very rare in children and something he shouldn’t have,) so it was considered an “oddity” and he was given an antiviral medication that’s given for chickenpox/shingles. We stayed home the rest of the weekend and let him get some rest. We headed back to Columbia to fine-tune Josiah’s leg brace since his leg should’ve been more loose from botox. His leg is still pretty tight, and the brace stretches it quite a bit, which he really doesn’t like. We are slowly increasing the time he is in his brace each day. While he protests, it’s not an absolute refusal and he is able to get around without pain, he just doesn’t like it. Hopefully he’ll be able to get used to it quickly. It makes his walk look much better, however, he’s not as fast as he’d like to be. I’d be frustrated too. Back to Columbia. This time was just a quick check-up and I didn’t expect anything different for Josiah. His hearing test was fine and ears looked great. That was easy. Ruth Ann also had a visit. She had an ear infection and her eardrum burst six weeks ago. That has all healed properly, however, the ear is infected again. Both ears have fluid behind them, and she has hearing loss in one ear because of that. So she’s on antibiotics again and will go back in two weeks to make sure it’s no longer infected. She’ll then go back in 2 months. If there’s still problems with fluid, we’ll be looking at putting tubes in her ears. Josiah will have his thyroid checked in 6 weeks, a follow-up endocrinology appointment in May, and MRI/botox in June. I’m hoping that’s all we have going as far as doctor’s appointments over the next few months! My daily prayers are with Josiah & your whole family. I praise God for the Good results & that finally someone tried to make his brace as fun as possible. Now he can show his fancy brace off to other kids & people. He is such a loving child & I miss seeing you all. I am 1 hour away & can be there in a heart beat if I can ever help in any way for any of your family. Love you all dearly. Oh thank you, Lynn! We miss seeing you as well. You’re such a blessing to those who know you!